For additional third-party real-time protection on a Mac, you could always install an “on demand” service which, rather than running continuously in the background, will scan your computer when you’re not trying to render animation, export a 4K video or crunch numbers, which all require vital CPU cycles. Step up Malwarebytes for Mac 3. 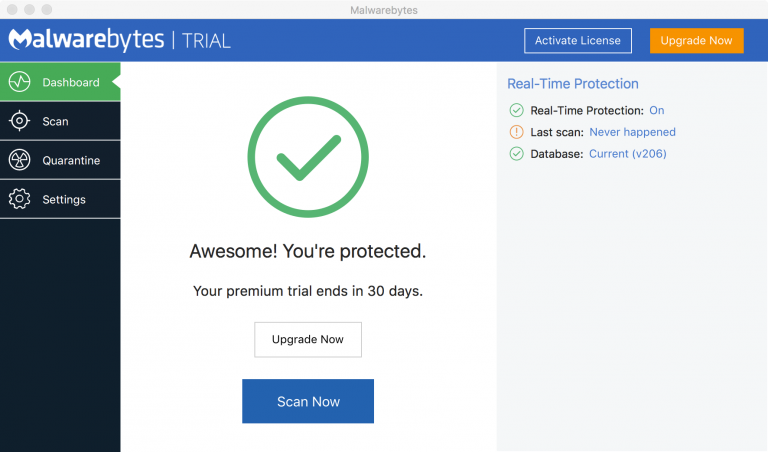 The previously titled Malwarebytes Anti-Malware was a huge success on the Windows platform, both as a free and premium version and it has now fully transitioned to the Mac OS. Available as a free on-demand scanner, we’d always recommend adding Malwarebytes to your arsenal of tools to combat malware. Produced and developed in the United States, there’s an element of background history behind the brand, too. You know they have your back. So, what’s new in v3? The first and most obvious addition is the new user-interface which has a consistent look of the Windows edition, without moving too far from Mac guidelines. Malwarebytes has added a menu bar for quick access, whilst a quarantine function will temporarily pause functionality rather than dumping files to trash. There’s also a trial mode so you can see the paid-for Premium features such as real-time protection. Apart from that, there’s not a huge amount of new features. This of this release as a transition period to move the Mac version alongside the Windows edition for future mutual updates. Malwarebytes for Mac v3 is available now and a Premium version is available for $39.99.